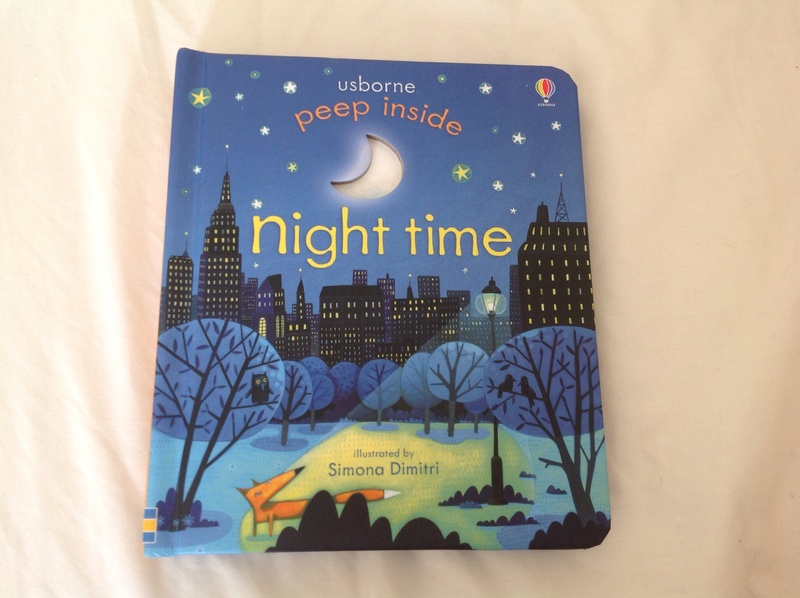 Usborne’s Peep Inside Night Time is illustrated by Simona Dimitri, written by Anna Milbourne and designed by Nicola Butler. What a little gem it is. Peep inside the starlit darkness to discover swooping owls, flitting bats, busy bakers and lots more. Plot, there is not. This is not an edge-of-your-seat story book. It is instead a series of detailed illustrations with lift-the-flap engineering that allows a glimpse into the world of night time. Sparse text adds some focus and there is a satisfactory structure in that it starts at bedtime when ‘the stars are twinkling’ and ends in the morning as ‘the sun comes up and brightens the sky’. This is an urban night time, complete with bakers, railway workers, buses, foxes, owls, moths around street lights, and an early morning market. There is a real beauty and detail to the urban landscape and it becomes a magical place to explore. The whole reason for the book existing is the ‘lift-the-flap’ element and this is where I think it gets really enjoyable. There are so many different types of flaps and windows to and explore, along with clever cut outs, such as the eyes of an owl doubling up on the next page as light from a lamp post. I particularly like the design because while ingenious, they haven’t got so clever with the paper work that you have an Ordnance Survey map moment of trying to close the damn thing. Some of my favourite ‘peek inside flaps’ are the simple windows and doors of the houses…they remind me of advent calendars and who doesn’t love advent calendars!? My son’s favourite page is the market scene…a colourful array of fruit, flowers and vegetables that he absolutely delights in identifying. Although I’m fairly sure those ‘hats’ are flowers and the potatoes are peaches but hey ho. I’m starting to notice that the content of our favourite reads are filtering into daytime activity and this book is no exception. When we go shopping LJ will reel off his shopping list suggestions to me and they all feature in this book. Likewise whenever we cook together we are now bakers…’mixing, kneading, shaping, baking’. I think it’s a lovely book for young children for sparking imaginations. I also think that if you are prepared to use the book in an interactive way with your child, like anything, you will both get a lot more out of it than is already there. There are a few more in the series covering farms, animal homes and zoos. I believe the illustrator is different for some titles. I’d be interested to give them a go, particularly the animal homes. Do let me know below if you’ve come across them and your thoughts! We’ve been enjoying it for about a month now, but just this week I’ve noticed a wane in energy. I might seek out some of the other titles. Yep…i know what you mean about the food obsession. My son’s absolute favourite bedtime read is the very hungry caterpillar and he can reel off saturday’s food by heart! I'm Lucy, very much a mother and very much more than a mother, struggling to work out how to fill in the 'occupation' part of forms. I teeter on the funny side (mostly amusing myself)...less lifestyle and more life-thoughts; welcome to my website.